A pair of empty-netters made the final score 6-3, which doesn’t come close to reflecting how close this game was or how Anaheim had the Predators on their heels for nearly the whole thing. But Pekka Rinne stood tall—he’s your premature Conn Smythe favorite—and Nashville found the goals it needed, when it needed them, and advanced in six. The Preds are a fast, feisty, well-coached team that does a little bit of everything; they deserve to be here. What, exactly, is “Predators hockey”? It’s been a tough question to answer all year for a trendy Cup pick that looked pretty mediocre in the regular season. But things have changed, and here’s something I never thought I’d say a couple of weeks ago: The Predators did this with depth scoring. Rinne’s goaltending and a glut of offensively capable blueliners papered over the fact that the Preds were getting a disproportionate amount of scoring from just their top line of Filip Forsberg, Ryan Johansen, and Viktor Arvidsson. It probably wasn’t sustainable; you don’t win four rounds without icing at least three lines capable of threatening. But after injuries to Johansen and second-line center Mike Fisher, coach Peter Laviolette decided to shuffle everything at the top, splitting up Forsberg and Arvidsson to try to spread out the firepower. Forsberg was placed with Pontus Aberg, a 23-year-old Swede who, after scoring the winner in Game 5, now has more points in the postseason than he did in the regular season, and Colton Sissons, the hero of Game 6. Sissons, thrust unexpectedly but not unwarrantedly into the role of first-line center, responded with just the fifth hat trick in a conference-clinching game since 1980, putting him the good company of Patrick Kane, Wayne Gretzky, Jari Kurri, and Mike Bossy. Arvidsson, meanwhile, has been placed with James Neal and Calle Jarnkrok, and while they’ve been relatively silent, the Predators have gotten two big games from the newly constituted third line of Austin Watson, Frederick Gaudreau, and Colin Wilson. On paper at least, Nashville matches up nicely with whoever comes out of the East. And yet they wouldn’t be here without Pekka Rinne. What else can you say about Rinne, the 34-year-old Finn selected 258th overall in 2004, in a draft round that no longer exists? He’s 12-4 in this postseason, with a 1.70 goals against average. His playoff save percentage of .942 is the best of any goalie with this many games in the last five years. 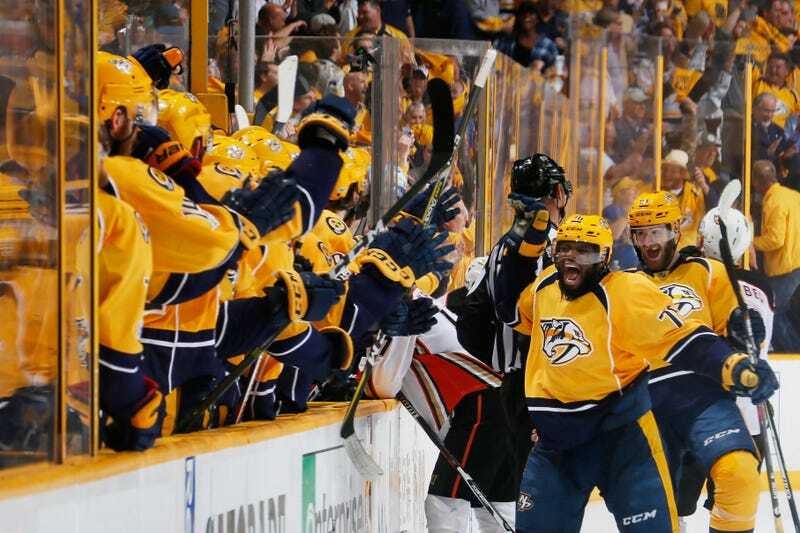 Rinne was the difference as the Ducks outshot Nashville 41-18 last night; Anaheim will spend the summer wondering how things might’ve gone if Jonathan Bernier hadn’t had to fill in for John Gibson, who left Game 5 with a hamstring injury. Rinne has been the difference all postseason, starting with a two-shutout performance in the Predators’ first-round sweep of No. 1 seed Chicago. Rinne has been a tricky goalie to peg over his career. Coaches and players rave about his skills, but the numbers were just never there, at least not the ones that would justify the seven-year, $49 million contract he signed in 2011. He was awful in last year’s postseason. But something’s changed this time around. Maybe the defense in front of him is just that good. Maybe he’s flipped a switch this late in his career. This does, somehow, feel like a long time coming for a franchise with more continuity than a relatively recent expansion team ought to have. In their 18 seasons, the Predators have had just two head coaches and one GM. They’ve cultivated a loyal fanbase, and have culminated in something of an identity, built around their Swedish firepower and their elite defensemen and a veteran goalie. Everything’s come together. After this year, even to casual fans, they’ll never be just another anonymous expansion team.